Jamaican Breakfast Soup – A taste of things to come? It’s also the season for receiving, and the winds of good fortune have been busy in blogland, first bringing Shauna the cookset of her dreams, and now, as it turns out, smiling on me. To explain my own good news, I’ll start by introducing you to my favorite British magazine: Food and Travel. It’ll have to be a verbal introduction, since the magazine’s website is currently undergoing renovation (update: it’s finally up and running!). I can’t comment favorably on their technological competence, but I can tell you how wonderful the magazine is. I ran across it the first time at Heathrow Airport while waiting for a connection, and all it took was one flip-through to fall in love. It combines my two great loves in a sleek and stylish monthly that can best be described as a cross between Condé Nast and Saveur. Sample content from the October issue, a particularly important issue for reasons which will become clear in a moment, include an article on the history of tea in India, the people and food of Turkey’s Black Sea coast, gourmet getaways in Switzerland, Spanish country cooking, and lots of other tidbits on great places to jet off to for a weekend or what to do with the produce currently in the market. And did I mention the photography? Food and Travel certainly excels in its location photography, but what constantly has my jaw dropping is the food photography. I’d go so far as to say that they possess the best food photography of any magazine I have ever bought, anywhere. Hopefully they’ll have their website up and running soon so you can test out my claim, but for now you’ll have to take my word for it. The only unfortunate thing about Food and Travel (besides their internet problems), is that the magazine can be difficult to find, at least in this part of the UK. It may be more widely available around London (where it is published), but after only being able to find it at airports (including ones on mainland Europe), I took out a subscription. Anyhow, like many magazines, Food and Travel often sponsors competitions, sometimes for a physical prize like a crate of champagne, and sometimes for a travel prize like a long weekend in Prague. These competitions are usually more like prize-draws than contests of knowledge or ability, as the entry requirement will be nothing more difficult than answering a simple question or two. I suppose these easy competitions are a way of tempting people into buying the magazine, or at least that’s what I’ve always assumed as I breeze right over the them on my way to the meatier articles. When the October issue arrived, however, I noticed right away that something was different. The competition this month wasn’t based on dumb luck; it was based on writing ability. Specifically, entrants were asked to write a short piece about Caribbean food – what makes it unique, for example – and submit this to the magazine by the end of the month. The promised prize was more than tempting enough to get my pen scribbling: a two-week, all-expenses-paid gourmet tour of Jamaica, and upon returning, the chance to write an article about it for publication in Food and Travel. Not one to waste an opportunity for what might be the career break of a lifetime, I sat down to write, and re-write, and scrunch it up and write it all again. In mid-October I submitted my piece, and crossed my fingers. By the beginning of December the deadline for winner notification had come and gone, and despite feeling slightly deflated (though naturally I hadn’t let my hopes get too high), I just assumed someone else had won and got on with things. But, well, it seems their website is not the only thing this magazine is a little behind schedule on. Last Friday morning, just as I was on my way out the door to work, I was surprised by the phone. I was even more surprised to have the editor-in-chief of Food and Travel on the other end. "I have some good news for you," she began, "can you guess where you’re going?" I believe she must have thought she lost me – it took me a me a full thirty seconds to reattach the connection between brain and mouth, such was my dumbstruck disbelief. "We loved your piece," she told me, "and we look forward to reading about your adventures for the magazine." I honestly don’t remember much of what I said to her, and when she asked me what I did I babbled on about too many things, including this website but stupidly neglecting to tell her the name. I did make sure to let her know my husband and I would also love to submit photographs along with the article about Jamaica, to which she heartily agreed. I also remember hanging up the phone in a state of shock and then giving in to the irresistible urge to jump up and down for a full five minutes. It was a good day. So there are still a million and one details to be worked out with the Jamaica Tourist Board (the competition’s other sponsor), but sometime before the end of June we’ll be jetting off to the Caribbean. Supposedly we’ll be visiting Blue Mountain coffee plantations, touring rum distilleries, attending cooking classes, meeting local chefs and shopping at markets all over the country. Between now and then I have a lot to learn about Jamaican food – not to mention I have to start building up my tolerance to those fiery scotch bonnet chilies that show up in everything, so I’m told. I got myself started (and in a nice tropical mood) over the weekend by preparing a recipe I used to make quite regularly, a kind of smoothie in a bowl I adapted years ago from a recipe in Sheila Lukins’ All Around the World Cookbook. Although I can’t remember whether its origins really lie in Jamaica (the book is in storage, unfortunately), something about the combination of the banana and coconut, the lime juice and cinnamon evokes some kind of sun-drenched exoticness. You don’t even have to add the rum extract, but it does help to complete the illusion. And though it may not seem like it, it’s a perfect Christmas recipe – light and healthy enough to combat the excesses of the night before, and tasty and unusual enough to serve as part of a larger brunch spread to visiting overnighters. And as this will be my last post before Christmas, I’d like to take the chance to wish each and every one of you a wonderful holiday. Whether you have snow or sunshine, mulled wine by the fire or cold beers by the barbie, I hope you have plenty of good food and drink, a chance to relax and unwind, and lots of laughter shared with good friends and family. And of course, I hope you get everything on your list, and more! Preheat the oven to 350F/180C. Spread the coconut in a baking dish and toast in the oven for about 10-12 minutes, or until evenly golden brown. Set aside to cool. Combine one of the bananas with all the other ingredients except the toasted coconut in a blender and blend until smooth. Taste and adjust the sweetness with more honey or the tartness with more lime juice. 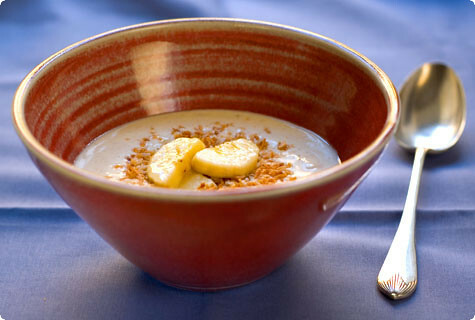 Stir in the slices of the second banana, ladle into shallow bowls and top with plenty of toasted coconut. Yay! Congratulations, my dear. I’m thrilled to bits for you, and I can’t wait to read your piece. And I hope you have a wonderfully alive, relaxed, and filled-with-laughter holiday week. Well done!! You thoroughly deserve it – I love your writing and your photos, and I’m sure the readers of Food and Travel will too. hi melissa, i honestly can’t think of anyone who deserves this more than you – your many talents were destined for just such an outlet…blogland’s best kept secret is a secret no more 😉 happy holidays! Congratulations. It sounds like a wonderful adventure. Dear Melissa,Wow, that sounds fabulous! You get what you deserve ,right? – sometimes it’s as easy as that 🙂 Please let us know, when the article is out during summer (I have been just an irregular reader of the magazine until now), but that will definitely be a reason to look out for it! Well done, that’s an excellent way to finish one year … looking forward to the next! Now THAT is one heck of a good Christmas present! Congratulations, dear Melissa, many times over! And, of course, happy holidays to you and yours. Hi Melissa,I believe CONGRATULATIONS are in order! It was only a matter of time before something like this came along. I’ve long admired your writing style and your beautiful photographs. Hopefully, this will springboard into something much bigger. HAPPY HOLIDAYS! Dear Melissa – what a wonderful surprise!!! It certainly will make it easier to get through the gloomy Edinburgh winter when you know you’ll be jetting off to sunny Jamaica with your beau soon. Well deserved and I’m looking forward to reading about your Jamaican adventure!PS Have you been to our local Jamaican restaurant – Coyaba – yet? If you could tell me how to recreate their chicken kuya, I’d be forever greatful:)Have a great festive season! Wow! Congratulations. How nice a surprise is this! Enjoy the feeling. Wish you happy holidays…..
Congratulations, Melissa! You definitely deserve it, I’m already looking forward to reading the issue. Happy holidays! That’s so thrilling Melissa! But I have to say, not an "unexpected gift" but a well deserved award. Such fun to look forward to both the trip and writing the article! Well it is no secret that I think you are extremely talented and I am not at all surprised that such an honour should come your way. You deserve it my friend! You put your whole heart and soul into this blog including every single one of your tastebuds. ;) All the best to you in 2006! No one deserves it more! Congratulations!! I can’t wait to hear about the trip and see the photographs. What a lovely opportunity! Merry Christmas. holy moly! that is brilliant news. and what a top christmas present, and so well deserved. i will have to check out this magazine 🙂 well done and merry christmas! Congratulations, Melissa! I love your writing (and photography) and am not at all surprised that you would be the winner of a writing contest. The other contenders didn’t have a chance! I can’t wait to hear about your trip to Jamaica. Although I’ve never been there or anywhere in the Caribbean, I love all the foods I’ve sampled from Jamaican restaurants. The thought of reclining on a beach sounds fabulous right about now, too.I also want to wish you and Manuel a happy holiday season! I look forward to enjoying more of your blog in 2006. Melissa,You totally deserve this. As an ex-magazine editor, I gotta say that you write better than many of the writers I’ve worked with over the years. I can foresee that within a few months, food publications will be clamoring to pay you for your words. And your photos! I remember meeting the founders of Food and Travel in 2002 at the World Magazine Marketplace in London. Great magazine. And really, really nice people. Unfortunately, the company I worked for already had a food magazine or I would have loved to have gotten a franchise of Food and Travel for Southeast Asia.Congrats again and merry Christmas! oh wow… wat a great blog! its a pleasure to read. An inspiration. And Im not kidding. Im inspired and very impressed! congratulations! I’ve loved reading your posts and you so deserve this! Ah! I am jumping up and down for you! Can’t wait to hear about your journey! WOW AND CONGRATS! Thank you Shauna, and the most wonderful holiday wishes back to you, my dear! Hi Shahnaz, thanks so much for these kind words! I’m touched. And of course I’m overjoyed to find out I’ve motivated you to cook. It means I’m doing my job well! 😉 I’ll definitely reprint or link to the article, as well as probably overwhelm everyone with more information about Jamaica than they ever wanted to know! Hi Enuwy – What lovely compliments, thank you! !J, I’ve been blushing for days since I read this. Thank you, my dear, for your faith in me! And the happiest of holidays to you and W. Hi Kalyn – Thank you. I have to agree! Hi Sam, jigging for me around your cube, that must have been quite a sight for your coworkers! I’m honored. I must admit I’m normally not much of a competition-enterer, but maybe I’ll have to rethink that. Competitions seem to be a way of life here – I wouldn’t be surprised if the London competitors club is still going strong. Nicky, it does seem easy in retrospect, but in fact I lost a few nights’ sleep trying to figure out how to say anything prize-worthy in only 500 words. I think that must be the real talent! 😉 And of course I’ll let you know the second the article comes out! Hi Martin – Amen to that, and thanks for stopping by! Hi Cioppino – Thank you! I also feel like I would love to just pack up and go now, but on the other hand, I also love the anticipation, so maybe waiting a few months isn’t that bad after all… 🙂	David, I will, don’t worry! 🙂	Molly, I’m not quite sure I really deserve such a gift, but it is wonderful. Thank you, my dear, for your constant support, friendship, and motivation to write better. I hope you’re having the most spectacular holidays ever! Thanks, Paz! And Merry Christmas to you. Hi Reid, happy holidays to you too! Thank you so much for your kind words, and for being such a frequent and supportive visitor. It’s always a pleasure to have you here! Hi Pille, thank you! It does make it better, though I still can’t quite believe it yet. As for Coyaba, I haven’t been there yet, but it just jumped to the top of the list – we’ve got to find out what’s in store for us food-wise! (and it looks like I know what I’ll order when we go 🙂 Hi Hande, thank you and the happiest of holidays to you too! Hi Keiko, thank you! Hope you’re having wonderful holidays down south. Stay warm! Plum, you’re so sweet! Thank you, my dear. 🙂	Michele, my dear friend, what would this blog have been without you? Your constant support, friendship, and good humor (not to mention good appetite!) have been such a blessing from the very beginning. Thank you for everything, and I can’t wait to see you again soon. Luisa, thank you!! Your words mean a lot to me. I hope a very Merry Christmas and a wonderful start to the new year find their way to you in Germany! Shauna, you continue setting the literary standard for all of us in this fair city and I’m counting the days until I see YOUR name in print. Thank you, my dear, and Merry Christmas! Brett, thank you. High praise indeed! Your own sharp wit, limitless knowledge of food and wonderful storytelling have been an inspiration to me. I can’t wait to see what exciting things you’ll have up your sleeve in the new year.Hi Chubby Hubby – Wow, thank you. I’m floored by your praise and very touched. I’m also glad to hear you’ve had positive dealings with F&T – I can’t figure out why they’re still so relatively obscure. But honestly, thank you, and I hope you and the lovely S are having truly wonderful holidays! Hi Shaz, thank you! Please do stop by again :)Hi Olduvai, thank you!! Hi Zoubida, thank you and you can be sure I’ll let you know. Happy Holidays and I hope you enjoy the soup! Kevin – :)Rachael, YOU are so sweet! I don’t know what to say, I’m just so tickled by your faith in me. Thank you. I hope you’re having utterly fantastic holidays!Aw, Matt, I’m glad to have someone jump up and down with! ;)Hi Nika, welcome and thank you for all your kind words! I’ve just had a look at your site and your pictures are gorgeous! Googs, can you believe it??? I still can’t! Too bad it’s not a trip for four…Kathi, thanks for stopping by! Seems my dear old dad is doing excellent PR work for me. I’m always glad to find fellow food and travel enthusiasts in the circles of friends and family – I hope we’ll have the chance to meet up some time when I’m in Portland! Congratulations, Melissa! I accidentally stumbled upon your site a couple of months ago and have no doubt that you deserve the coveted first prize. Think of me salivating while you down ’em rum-my drinks!